Love chocolate? Well then you will love this chocolate pamper hamper filled with chocolate fragranced bath products including body soap, body lotion, bath dust, a slab soap, and some chocolate nut body scrub and body butter. 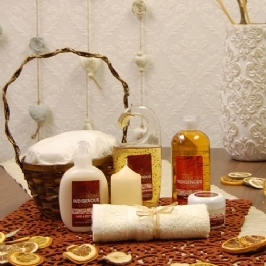 A shower flower, pumice stone and candle completes this yummy chocolate pamper hamper.